Sometimes it’s hard to believe that Tammy and I have been married for six seven years. And that’s not just because neither of us really knew our exact anniversary, day or year, until a couple of days ago. Apparently Tammy told some of The Girls at work that our anniversary was coming up and when she wasn’t sure of the date, she sent me a message on Yahoo! Chat. Tammy: What year were we married? Me: 2005… April 16, 2005. Me: Yup. Why? I even went to check just so I could tell you that I was right. Tammy: ’cause we were trying to figure it out and in ’05 the 16th was a Friday. I thought it was a Saturday when we got married. Me: I don’t know what you’re looking at but April 16 in 2005 WAS on a Saturday. Me: Why ya’ll trying to it figure out? Tammy: Nothing, just when we got married ’cause I didn’t know. 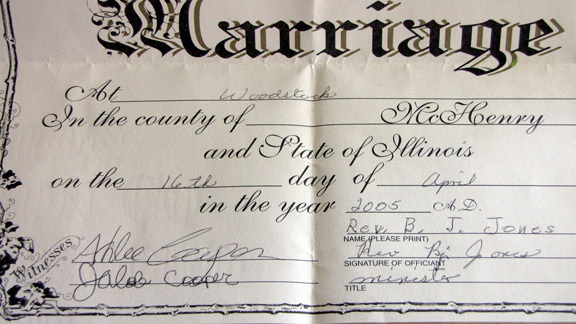 I then proceeded to take a picture of our Marriage License and emailed to to Tammy in case she forgets. But a couple of days later we were laying on the bed and she seemed to forget again. Tammy: Six years ago we were about to get married. Tammy: You sure? I think it was eight. Me: (counting with my fingers) We got married in 2005, so 2006, 2007, 2008, 2009, 2010, 2011, 2012. That’s seven. Tammy: You’re right. I was just kidding you about it being six, but I really did think it was eight instead. The Girls thought it was funny that neither of us could remember our anniversary, but that’s how it’s always been with us. Neither of us are very big on celebrating our birthdays either. There have been times Tammy has told me NOT to get her anything (cards/flowers) and it’s not one of those “she’s telling me NOT to do something when she really means it” things. Now don’t get me wrong, I’ve gotten her stuff when she says not to and she appreciates it. She’s just not a big pomp and circumstance type of person. 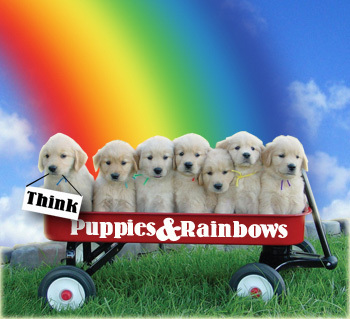 I wish I could say the past seven years were all puppy dogs and rainbows but unfortunately that’s not the case. And I’m not saying that because I “torment Tammy” on a daily basis. The first couple of years of our marriage we went through a lot of hardships that would have broken up a lot of people. Our relationship was broken and we were at a point where we had to decide to walk away or work to make things better. We may have been married on April 16, but there is another date that’s just as important to me, July 18. That’s the day things turned around and I realized that love never fails, but that’s a story for another day. We’ve been together for nearly 13 years and have the scars to prove it. But those scars aren’t necessarily a bad thing. Those scars are not just reminders of where we have been, but what we have been through. They represent our relationship, the good, the bad and the ugly. They represent what each of us were willing to go through to show how much we love the other person. Don’t get me wrong, they most definitely represent pain, but they are also symbols of what we have been willing to go through, with and for each other in the name of love, and our marriage. It’s because of those scars that we are able to celebrate six, I mean, seven years together. I didn’t want to end this post on a sad note and since Tammy just called it “a bit mushy” after I read this to her I decided to add this new section of some of our recent interactions. Tammy: I love looking at myself in the mirror because I get better looking everyday. Me: Yeah, because your eyesight is getting worse everyday. Tammy: My eyesight is FINE. I see what you look like everyday. Tammy: If we just teamed up and did stuff together it’d go a lot faster. Tammy: Like when I was blow-drying my hair you could have been taking this stuff (makeup?) off my eyes and I’d have been done already. Me: You don’t want me doing that to you. Tammy: All I know is them b!tches (on Big Rich Texas) make me NOT want to live in Texas. But Kelly lives there so it can’t be all bad. Me: It’s a big state you know. Tammy: I know. But I know I don’t ever want to live in New Jersey. Tammy: (After jabbing at me a couple of times) We should play fight so we could practice our skills. Tammy: Because most people that have guns nowadays get them illegally and can’t afford an extra $2,000 for one. Me: (laughing) You just made up this whole scenario in your head. Tonight the silencer comments continued with Tammy. Tammy: Did you ever look it up? Tammy: Of course not, you don’t ever want to prove me right. Me: No, because if I look it up I can’t ever use one. Also tonight while we were watching an episode of Survivor and I was glad to see a guy get voted off, which didn’t sit well with Tammy. Tammy: Why don’t you like him? Me: I don’t like how he talks. Tammy: You are so superficial. Me: Yeah, well you like how he looks. 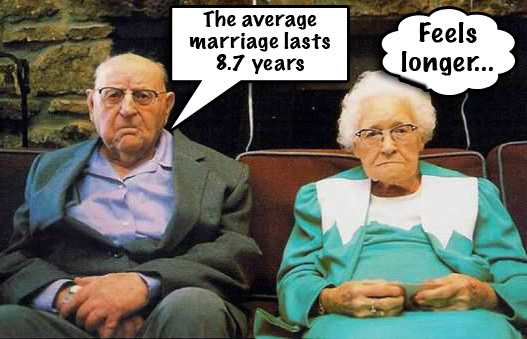 Gallery | This entry was posted in Daily Life and tagged daily life, humor, marriage, postaweek2012, Tammy. Bookmark the permalink. 17 Responses to It’s Our Anniversary, Right? The minister’s name who married you is B.J.? That’s awesome. I’m bout to meet Tammy at her sister’s salon to get our hair did then we’re heading out to celebrate (I’m thinking margaritas are in order!!). they can be so fun they listen, but I just feel like I don’t know how to pose them. Thank you so much for ptinsog this and giving me some inspiration to work with more Seniors. Your work is amazing. I’m not sure what it says about me that I was born in New Jersey and now live in Texas. I’m sure I’m the exception to Tammy’s rules. Corpus Crispy! I love it! I am totally going to call it that from now on! This… and several other posts of yours have made me laugh. : ) Thanks!!! Thanks for stopping by. I’m glad you enjoyed what you read and that I could make you laugh. Hi Linda,I just discovered your blog thguorh your comment on mine.I love the name of your blog, and am intrigued by the titles of your postings. I liked going topicless and will be back to read more.